The genesis of the WCW Color Scenario Pack was a desire to create some original scenarios for the 1995 ASL Open tournament–and, for novelty sake, to do them in color. At the time, there had never been any ASL scenarios printed in color. They decided to use two scenarios (which appear in their ASL Stuff compilation). However, major technical difficulties (of a kind, considering how much easier and more sophisticated desk-top publishing is a decade later, that seem almost incomprehensible today–such as a computer not having enough memory to print out a single scenario card in one go) caused them to fail to make their deadlines, so they postponed the project until the next year’s open. In the meantime, they would develop even more scenarios. It appears that Louis Tokarz himself did the artwork (drawings rather than photographs appear on each scenario card). After a huge number of additional computer problems, they actually managed to create the set. It was available to people at the Open and could be ordered for some time after that. The scenarios represent a wide range of actions, from Spain to China to North Africa to the Soviet Union to Belgium. All are small or medium-sized and are easily playable at tournaments. One scenario, WCW4 (Cat Becomes the Mouse), is all armor (plus one AT gun). One scenario has OBA, one is a Night scenario, and one uses (dry) rice paddies. 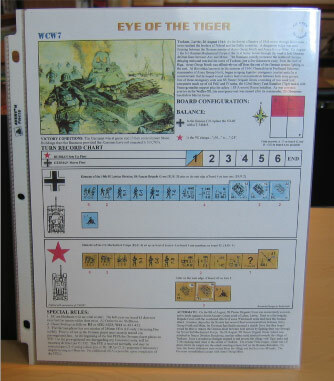 This is one of the best ASL scenario packs ever published. Of the 10 scenarios, only one (WCW3, Tigers at Merefa) seems to be unbalanced. Some of them, even after more than 100 playings reported to ROAR, are still exquisitely balanced. 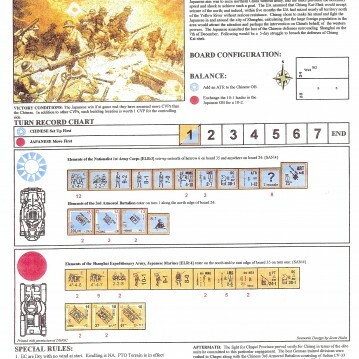 Four of the scenarios in the pack are undeniable all-time ASL classics: WCW1 (Will to Fight–Eradicated, designed by Louis Tokarz, and later reprinted as an official scenario, G40, in The General), WCW5 (Abandon Ship, designed by Jeff Cebula, also reprinted as an official scenario, G44, in The General), WCW7 (Eye of the Tiger, designed by Scott Holst), and WCW10 (Stand and Die, also designed by Scott Holst). 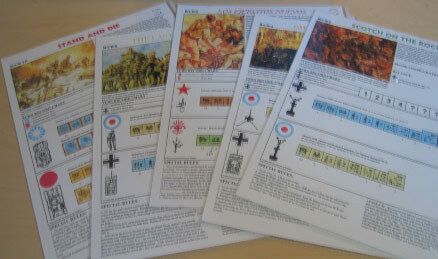 In 1997, Louis Tokarz stated that Avalon Hill proved uninterested in giving further permission to the Windy City Wargamers to use “official” ASL artwork. Tokarz said that he was not interested in publishing more scenarios unless they were at that same level of physical quality. Unfortunately, it also meant that WCW would not reprint the WCW pack, either, which quickly sold out and became a hard to find collectors items (most of the copies that most ASLers have are just that–photocopies). It is a frustrating turn of affairs when one of the best ASL products of all time is consigned to a forced oblivion. NEW: In 2008, Louie Tokarz generously decided to allow the WCW pack scenarios be available for FREE DOWNLOAD from the Desperation Morale site. Now you too can finally get these classic scenarios! Alas, this pack is now no longer downloadable from this site. 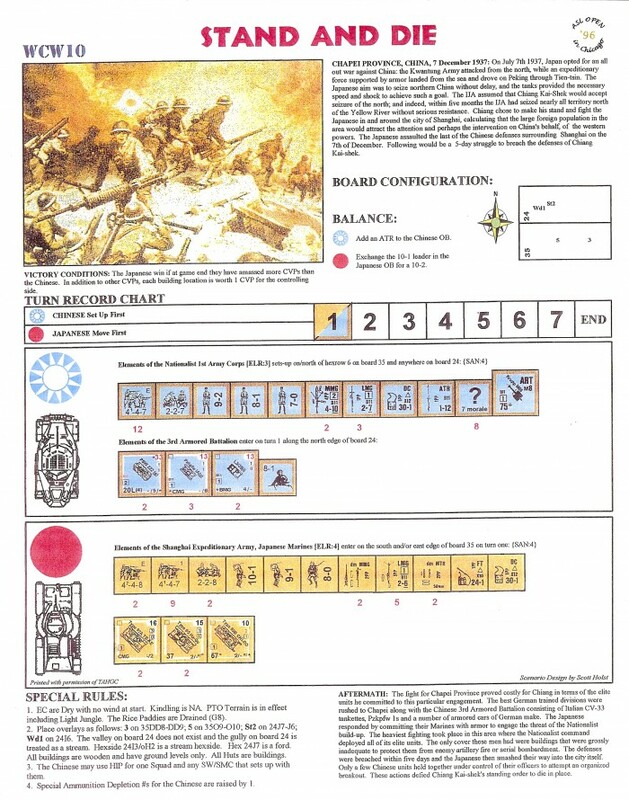 Correction – you can download it from the scenario section, just not from the above link.